Welcome to our Help section. We at PolkadotYourWorld want to make your shopping process as easy as possible. If you still have questions after browsing the topics below, feel free to contact us directly at customerservice@PolkadotYourWorld.com. We offer a variety of items that you can personalize to make your very own. Pick a category from the menu on the left, then click on the picture of the product you are interested in. Choose your area of personalization. On greeting cards there are typically 2 options "inside front cover" and "inside back cover". Remember that the typical space to write in a card would be the "inside back cover" space. However, if you want to include a longer message, a letter, or anything else you can use the "inside front cover" space to achieve your desired design. For Pizazz designs there may also be the option to customize the front of the card. To choose your area of personalization simply click on the desired tab at the top of the page. Type your message into the text box. Make sure you check out our different font settings and sizes too. If you wish to move the text, you can also highlight it and click the icons to center it, align it with the left margin or align it with the right margin. Click on "See what you created!" to check out the text you entered. 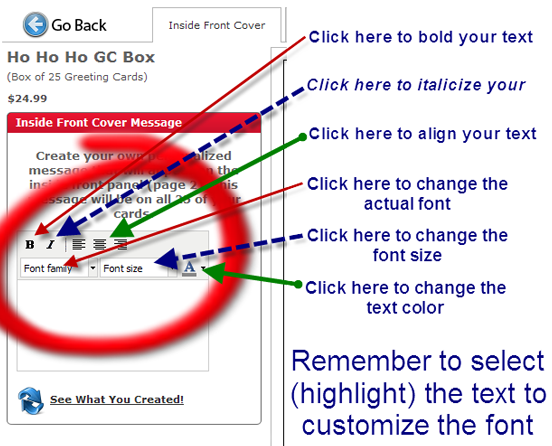 If you want to change your message or the layout go back to steps 1-3 and try again! Choose your area of personalization. For postcards this would typically be the "back of postcard" space. For Pizazz designs there may also be the option to customize the front of the postcard. This is denoted as "Name in image". To choose your area of personalization simply click on the desired tab at the top of the page. Choose your area of personalization. For most posters this will be the "name in image" space. To choose your area of personalization, simply click on the desired tab at the top of the page. Once you have personalized your product, click on "click to see your proof" at the upper right of the image to see a final draft of your creation! To purchase your personalized product, follow the steps to Preview It. If you are satisfied and don't want to make any more changes, click on "I Approve" at the upper right of the previewed image, then follow the steps to complete your order! How do I use the Photo Upload feature? Simply click on the upload photo and follow the instructions. We currently accept credit card payments through our secure payment gateway. We accept Visa, Mastercard, Discover and American Express. Changes to personalized orders cannot be accepted once you have completed and paid for your order. Completion of your order confirms and acknowledges that you have reviewed and verified the accuracy of your entire order before it was sent and paid for. All boxed card sets will be shipped to you within 5 to 10 business days. Log in to the shop and go to the "My Account" link at the top of the home page, then click on "Your Orders" and you will see the status of your order(s). If you have any additional questions, please email us directly at customerservice@PolkadotYourWorld.com. To return a product you must first request a RMA#. Please email us at customerservice@PolkadotYourWorld.com to request this number. Please provide your order number and date of purchase. We will contact you by e-mail with all appropriate instructions to return your product. Customer Satisfaction is our top priority! If the item is damaged during shipment, we will replace the item. Personalized items cannot be returned for incorrect spelling or graphics unless item is different than the approved proof online. I cannot find the answer to my question - How do I contact you? Please e-mail us at customerservice@PolkadotYourWorld.com and we will get back to you shortly.